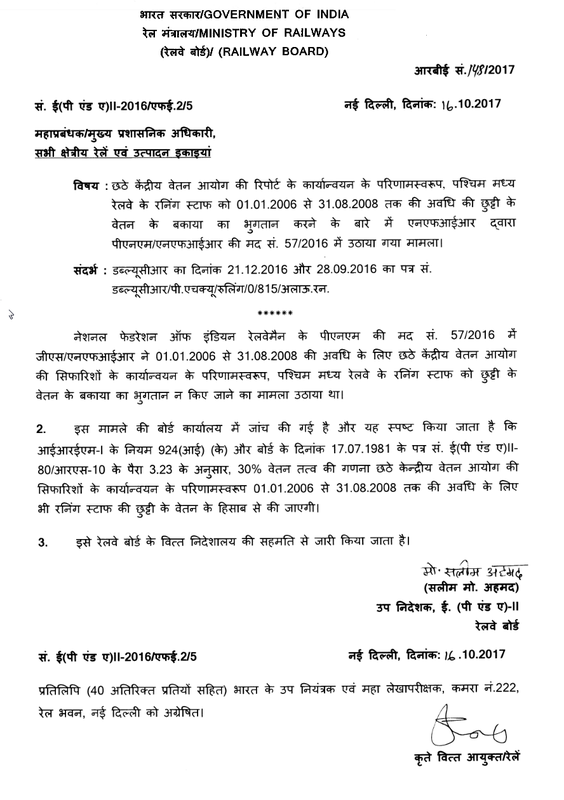 Payment of arrears arising out of leave salary for the period 01.01.2006 to 31.08.2008 to the Railway running staff. Sub: Issue raised by NFIR in PNM/NFIR item No. 57/2016 regarding Payment of arrears arising out of leave salary consequent to the implementation of 6th CPC report for the period 01.01.2006 to 31.08.2008 on West Central Railway to the running staff. Ref. : WCR’s letter No. WCR/P.HQ/Ruling/0/8I5/Allow.Runn. dated 21.12.2016 and 28.09.2016. In PNM Item No. 57/2016 of National Federation of Indian Railwaymen, GS/N FIR had raised the issue of non-payment of arrears of leave salary to running staff of West Central Railway, consequent to the implementation of 6th CPC for the period 01.01.2006 to 3 1.08.2008. 2. The issue has been examined in Board’s office and it is clarified that as per Rule 924(i) (k) of IREM-I and para 3.23 of Board’s letter No. 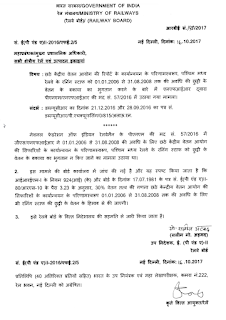 E(P&A)II-80/RS-10 dated 17.07.1981, 30% Pay element will be reckoned for calculation of Leave Salary of Running Staff for the period between 01.01.2006 to 31.08.2008 also consequent to implementation of the 6th CPC recommendations. Copy (with 40 spares) forwarded to the Deputy Comptroller & Auditor General of India, Room No.222, Rail Bhawan, New Delhi. (1) The PFAs, All Indian Railways & Production Units etc. (2) The Chief Commissioner of Railway Safety, 16, Ashok Road, Lucknow. (3) Director General RDSO Lucknow. (5) The Principal, Railway Staff College, Vadodara. (6) The Chairman RCC Lok Sabha Secretariat, New Delhi. (7) The Chairman RRT, Chennai. (8) The Chairman RCT, Delhi. (9) The Chairman RRB/Aj mer, Ahmedabad, Allahabad, Bilaspur, Bangalore, Bhopal, Bhubaneshwar, Chandigarh, Kolkata, Jammu, Gorakhpur, Guwahati, Malda, Mumbai, Muzaffarpur, Patna, Ranchi, Secunderabad and Trivandrum. (10) The General Manager CORE, Allahabad. (11) The Editor, ‘Bhartiya Rail’ Room No.469, Rail Bhawan, New Delhi. (12) The Editor, ‘Indian Railways’ Room No. 411, Rail Bhawan, New Delhi. (13) The Editor, ‘Rail Rajbhasha’, Room No.543, Rail Bhawan, New Delhi. (14) The Chairman, Passenger Services Committee, 218, Rail Bhawan, New Delhi. (15) The C.A.O. (R) COFMOW, Tilak Bridge, New Delhi. (17) The C.A.Os,(a) MTP(R) Mumbai, (b) MTP(R) Chennai. (18) Office of the Chief Project Administrator (Telecom), Indian Railway Centre Organization for Telecom Consultancy, Shivaji Bridge, New Delhi. (19) The Chief Mining Advisor, Ministry of Railways, Dhanbad,. (20) The C.A.O.(Const). Central Railway, Mumbai. (21) The Director (Movement) Railways/Kolkata. (22) The Gen. Secy., IRCA, DRM Office Complex, State Entry Road, New Delhi. (23) The General Manager, CAO/FOIS Office, Northern Railway, CRIS Camp Chanakayapuri, New Delhi. (24) M/s Bahari Brothers, 742, Lajpat Rai Market, PO. Box No. 2032, Delhi -06. (i) The General Secretary, AIRF (with 35 spares). (ii) The General Secretary, NF IR (with 35 spares). (iii) The Members of the National Council, Departmental Council and Secretary/ Staff side, National Council, l3-C Ferozeshah Road, New Delhi (with 90 Spares). (iv) The Secretary General, FROA. (v) The Secretary General, IRPOF. (vi) The Secretary General, All India RPF Association. (vii) The Secretary, Indian Railways Class II Officers’ Association. (viii) The Secretary, RBSS, Group A Officers’ Association, Room No.402, Rail Bhawan, New Delhi. (ix) The Secretary, Railway Board Group ‘B’ Officers’ Association. (x) The Secretary, Railway Board Ministerial Staff Association. (xi) The General Secretary, Non-Ministerial Staff Association, Rail Bhawan. (xii) The General Secretary, Railway Board Secretariat Stenographers Services Association, Rail Bhawan. (xiii) The Secretary, Railway Board Group ‘D’ Employees Association. (xiv) The General Secretary, All India SC/ST Railway Employees Association, Room No.8, Rail Bhawan, New Delhi. (xv) All India O.B.C. Railway Employee’s Association. (xvi) The General Secretary, Retired Railway Employees Welfare Association, Room No. 490 A/ 16, Gurudwara Road, Gurgaon. MR, MSR(S), MSR(G), CRB, FC, M(Tr. ), ME, M(RS), MS, MT, DG/RHS, DG/RPF, DG(S&T), DG(P), DG(S), Secy.RB, AM(B), AM(CE), AM(C), AM(C&IS), AM(Elec), AM(F), AM(Plg), AM(Projects), AM(Sig), AM(MS), AM(Mech), AM(PU), AM(RS), AM(T&C), AM(Telecom), AM(T), AM(Vig), AM(Works), AM(Staff), Adv(AR), Adv(F), Adv(IR), Adv(Safety), Adv. (C), ED(Plg. ), ED(A), EDF(BC), EDCE(B&S), EDCE(G), EDCE(Plg. ), ED(Chg.), ED(CC), ED(C&IS), ED(E&R), EDEE(Dev. ), EDEE(G), EDEE(RS), EDE, EDE(RRB), EDE(N), EDE(Res. ), EDF(C), EDF(E), EDF(S), EDF(B), EDF(RM), EDF(X)I, EDF(X)II, ED(H), ED(LM), ED(MIS), EDE(GC), EDT(MPP), EDME(Chg.), EDME(FR), EDME(Tr. ), EDME(TOT), EDME(Dev. ), EDME(W), EDPC-I & II, ED(Plg. ), ED(PP), ED (Proj. ), ED (Proj. )DMRC, ED(RE), EDRE(S&T), EDRE(S), ED(Safety), ED(Sig. ), ED(S&E),EDRS(C), EDRS(G), EDRS(P), EDRS(S), EDRS(W), ED(TD), EDTrack(M), EDTrack(MC), EDTrack(P), ED(T&C), ED(CP), ED(PM), ED(PG), EDT(R), EDTC(FM), EDTT(M), EDTT(FM), EDTT(S), EDV(A), EDV(E), EDV(S), EDV(T), ED(W), ED/ERP, IG/RPF(HQs), IG/RS, JS, JS(D), JS(E), JS(G), JS(P), DPC-I, DPC-II, DE(N), DF(CCA), DF(A/Cs), DE(G), DE(N), DPR, JDE(G), JDE(D&A), JDE(L), JDE(LL), DE(P&A), JDPC-II, JDE(W), JDF(B), JDF(E),JDE(N), JDE(Res), JD(MPP), JDE(GP), DS(G), DS(Parl), US(A), PAO, DDE(P&A)II, DDE(D&A), JDE(RRB), DDE(Sports), DDE(N), DDE(LR)I, DDF(E)I, II, & III, DD(H), DDE(R)II (with 2 spares), DDE(W), DDPC-V, VI VII, DDE(Trg). Branches : Accounts.-III(with 10 spares), Budget, Budget(Com)I, Cash-I, Cash-II, Cash-III, Chasing, E(P&A)I, ERB-I, ERB-II, ERB-III, ERB-IV, ERB-V, ERB(D), E(LR)I, E(LR)II, E(LR)III, E(NG)I, E(NG)II, E(RRB), E(Rep)I, E(Rep)II, E(Rep)III, E(MPP), E(Welfare), E(G), E(Coop), E(LL), E(Sports), E(ML), E(SCT), E(D&A), E(GC), E(GR)I, E(GR)II, E(O)I, E(O)II, E(O)III, F(E)I, F(E)II, F(E)III, F(E)Spl, G(Pass), G(Acc), Issue(D), M(L), Parl., PC-III, IV, V, VI & VII, Project Cell, PR, PG, Sec(E) & Sec(ABE).